The first Scottish Cup was held at Pont Royal … under the leadership of Carolyn and Tom and with the participation of Jeanie and Simon, Roy and Claudine, Derek Anderson and George Freeland. The day got off to an early start in hot sunny weather and with a remarkable investment by the “Scots team” before and during the event. Some Scottish refreshments mid-course were distributed by Heather, Suzanna and Jacob followed by a sumptuous award ceremony on the terrace of Es Beu la Vie. Prizes for the first teams, longest drive and nearest the pin… and lots of lots in the draw which delighted the participants. Haggis was served with the cocktails, a gastronomic discovery for some, which added a” Scottish flavour” to the reception. The consensus of all participants, according to the clapometer volume, was congratulations to the Scotland team and a wish for it to be the first in a long series! 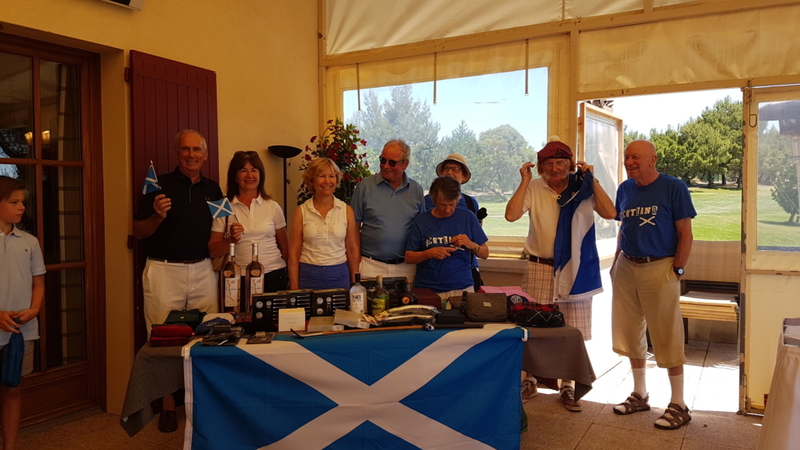 A big thank you to our Scottish sponsors Gold Brothers, Tunnocks Bakery and VisitScotland for their generosity, to Chateau Calavon for their loyalty … and a nod to Krys, Inguimbert optics, in Mallemort, sponsor of our Seniors team who offered a pair of special Ryder Cup glasses in the draw.